Jesse Owens and Joe Louis were born within eight months of each other in Alabama. They were the grandsons of slaves and the sons of sharecroppers. They both stammered. Their families moved north in the 1920s and they discovered themselves in sport – Jesse as a runner on the Cleveland sidewalks and Joe as a fighter in a Detroit gym. They soon realized how much they loved pretty girls and swanky clothes. Yet there were stark differences. Joe never smiled in public; Jesse rarely stopped grinning. Jesse looked as if he had found paradise as he ran "smooth as the west wind", and for free, on the amateur track; Joe marched silently into the gangster-ridden world of professional boxing. Joe was surrounded by an all-black entourage; Jesse's mentors and coaches were white. Jesse had made it to college while Joe was dismissed as a virtual illiterate. Joe said little in public; Jesse loved the idea of becoming a motivational speaker. And, of course, Joe was a ferocious puncher while Jesse was a serene runner and jumper. Within months of meeting each other in the mid-1930s they became heroic figures – and the first black men to scale the peak of American sport. They faced triumph and despair within an extraordinary twenty-two month period. Louis' two encounters with Max Schmeling ended in humiliating defeat and exhilarating victory – while the thrill and significance of Owens's four gold medals at the Berlin Olympics were soon tarnished when he was banned from ever competing again by the American Athletics Association who accused him of being "a professional." The racist undertow was impossible to miss – especially against an athlete who had done so much to undermine the Nazis' myth of Aryan supremacy. Owens only ran one more race after the Berlin Olympics – in a meaningless relay in London in August 1936. After he was banned by his own association he was reduced to running against horses and dogs and trains for money. Owens then became a bankrupt dry-cleaner, a sacked suit-salesman, a slick public speaker and an admired government representative around the world. He was hounded by the IRS and followed by the FBI. Louis, meanwhile, had been forced to fight on years after he should have retired. He held the world title between 1937 and 1949 and successfully defended his world title a record twenty-five times. Yet he ended up destitute. He was hunted by the IRS and reduced to wrestling, pretending to be a lion-tamer in a circus and working as a greeter in Las Vegas. His debt was in the millions as he slid helplessly into drug addiction and a psychiatric institution. They were revered for their patriotism in World War II and yet, in the militant 1960s, Jesse and Joe were derided as 'Uncle Toms'. At the same time, Louis's name was also invoked by black leaders from Martin Luther King to Malcolm X. There is no more poignant tribute to the impact of Louis on America than the anecdote related by King in 1964. Recalling the day when a young black American on death row was gassed, King told how the condemned man fell to his knees and cried: "Save me Joe Louis, save me Joe Louis, save me Joe Louis..."
Jesse and Joe, who had been friends for forty-five years, both died at the age of sixty-six. 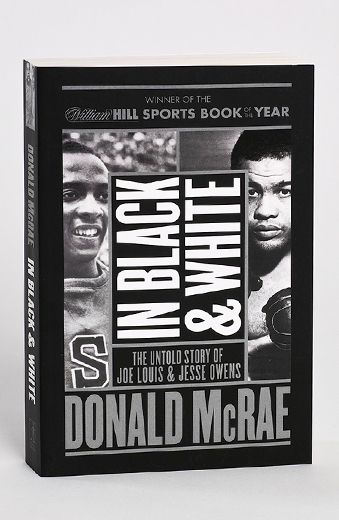 The heart of this book, which spans the tumultuous lives of Louis and Owens from 1935 to 1980, is brought to life during their most vivid moments on the track and in the ring – whether it's Owens breaking three world records and equalling a fourth in the space of forty-five minutes or Louis punching his way to the heavyweight title. Their most unforgettable moments – when they both defied Hitler's yearning for white supremacy – resonate throughout. And yet their raw humanity, amid great victories and difficult days, means that we always see them as men rather than icons of the past.